This is the inside of the Church of the Most Precious Blood in Cabra West. I especially took this photograph from a low down position to remind me of what it must have looked like for me as a small child coming here to attend Mass with my brothers and sisters so many years ago. I also made my Confirmation here as did most of my brothers and sisters, some of them were even married here and my parents were brought here to receive their funeral rites. As young children we were brought here to attend ten o’clock Mass every Sunday morning and later on we would go to Sodality once a month. Most Saturdays we would come here for confession. I remember the very day I made my Confirmation in this church and being terrified of the idea that the Archbishop, John Charles McQuade was going to slap me on the face. You see that morning my older brothers were telling me that the Archbishop would ask me a ‘Holy Question ‘ and if I answered it correctly he would give me a slap on the side of my face but if I answered it wrong that he’d give me a box in the face. I told my pal who was sitting next to me in the pew what my brothers had told me and he said ‘If he hits me I’m going to hit him back’. Well this only added to my stress and fear. When it came my turn to walk up the aisle my poor stomach was in a knot and I was praying to all the saints and angels in heaven above to help me give the correct answer. I even whispered to God that if he helped me I’d become a priest when I was older. I felt like Gary Cooper being dragged to the gallows in the film ‘The Hanging Tree’ . Well I needn’t have worked myself into such a state because the Archbishop never opened his mouth to me. He just gave me a gentle tap on the side of my face and left it at that. So I didn’t have to become a priest after all. The other day I attended ten o’clock Mass in this church. I sat at the very back so that I could observe the other people, mainly older retired people and to look up at the priest on the altar. It was an interesting experience as I sat there remembering and recalling how so much of my younger life revolved around this fine edifice. I thought of all my old school pals who were often marched here from nearby Finbars School. I remembered that most of them like me will turn 60 this year. I was also very aware not to speak above a whisper or to make unnecessary noises with my feet. When my family moved into the Cabra West estate in 1943 they had no church of their own. 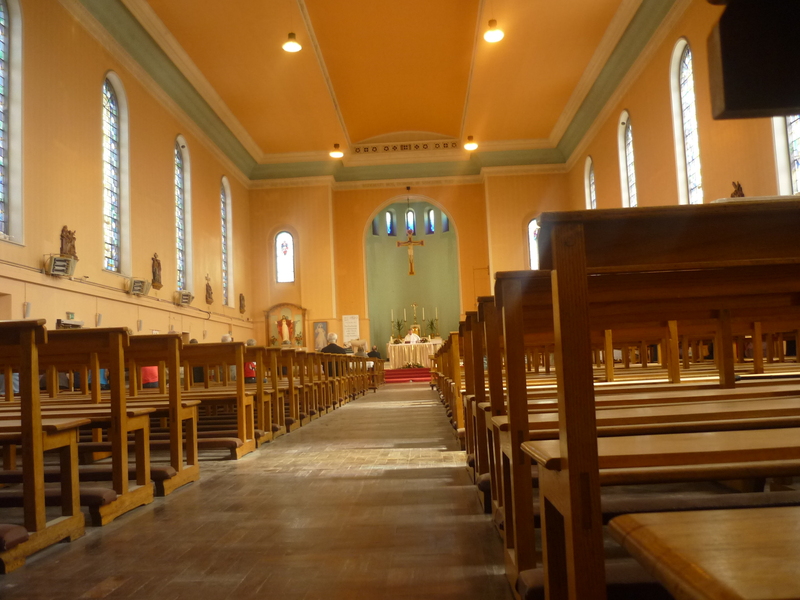 Some people attended Mass and confession in Christ the King Church off the New Cabra Road while others went further into town. My parents however attended Mass in the little chapel in Saint Joseph’s School for deaf and dumb boys on Rathoath Road that was just around the corner from our house on Killala Road. The Most Precious Blood Church was blessed and dedicated in 1951. I was the first member of our family of 15 children to be baptised there in November of that year. How the years have flown so quickly. I sat in the pew trying to recall all the old neighbours who came here every Sunday. The men standing at the back of the church with their caps in their hands and the and women wearing scarf’s to cover their heads. Some of these men would also call in on their way to and from work to say a little prayer or light a candle. The women were probably too busy rearing large families and didn’t have time to go to Mass every day. After the mass was over I went up and lit two candles. One was for all those sins I never told in confession, even the ones I could have made up and the second candle I lit was in memory of my parents and their good neighbours who are no longer with us. I do this every time I go into a church that has candles. I love going into churches regardless of which religion they are and I love going into graveyards too. So maybe the next time you’re in a church either at home or on holiday, you might light a candle or two yourselves and think of all the good people you’ve come across in your life. So many memories came flooding into my poor head that day that I nearly got a kind of ‘Holy Headache’.